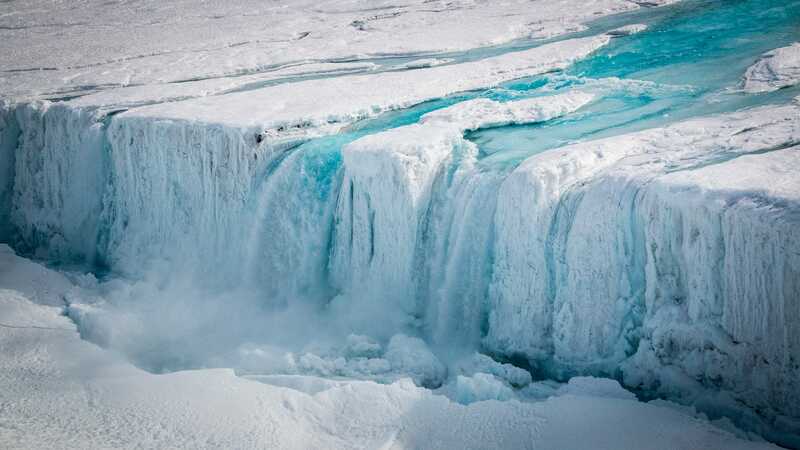 C. Yakiwchuck/ESAA waterfall caused by surface melt pours into a fracture in Antarctica’s Nansen ice shelf. 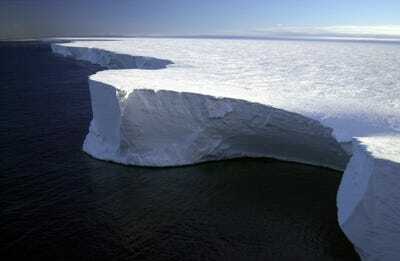 An iceberg six times the size of the ACT broke off of an Antarctic ice shelf between July 10 and July 12. Scientists aren’t sure exactly what caused the crack that birthed iceberg A68, as it’s called. One explanation could be summer surface melt water that acted like a wedge on small cracks, eventually opening them into a large rift. When it comes to buckling ancient, thousand-foot-thick ice shelves — and perhaps the 1.1-trillion-ton, Delaware-size piece of ice that Antarctica just shed into the sea — Ovid may have been wise beyond his years. The iceberg, dubbed A68 by the US National Ice Center, took years to form as the result of a crack in the Larsen C ice shelf. The crack formed around 2010 but grew rapidly starting in 2016. A68 is already starting to fall apart, though its journey toward melting could take years. While the world watches it slowly disintegrate, many are left wondering: What caused the iceberg to break off? One driving, Ovid-like force may be similar to what doomed Larsen B, a nearby ice shelf on the Antarctic Peninsula. Over the past 50 years, this region has experienced warming that is three times greater than the global average. In 2002, scientists looked on as nearly the entire Larsen B ice shelf fell into the sea after a large piece calved into the Southern Ocean. 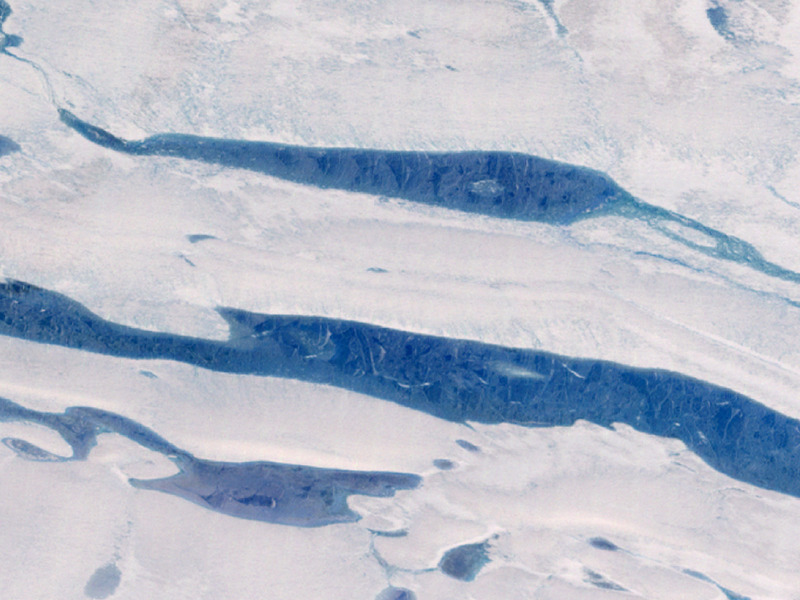 NASA/MODISSurface melt water on East Antarctica’s Amery Ice Shelf, as seen by NASA’s Landsat 4 satellite. The animation bellow, by NASA’s Earth Observatory, shows the collapse of Larsen B over the course of a few months. 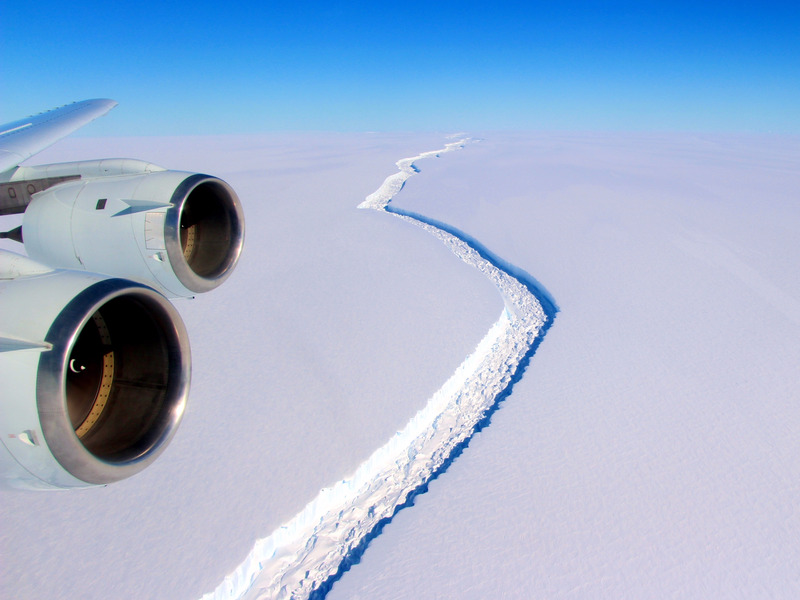 O’Leary said no one can be certain what caused iceberg A68 to break off, or at least yet; it’s far too cold in the Antarctic winter to fly in a crack research team. We may have to wait until November, when the southern hemisphere waxes toward summer and it becomes safe to fly aeroplanes over Antarctica again. For now all we can rely on for now are satellite images and aerial photos taken by NASA in late 2016. How much are humans to blame? O’Leary and his colleague Adrian Luckman, who’s also with Swansea University and Project Midas, previously suggested that A68’s calving was “a natural event“. After all, ice shelves have been cracking off huge icebergs for eons. Josh Landis/NSFIceberg B-15A was a fragment of iceberg B-15, the largest ever recorded with a surface are of 4,200 square miles (11,00 square kilometers). Yet other scientists say this perspective is akin looking at the situation “through a microscope” instead of acknowledging the bigger, inevitable picture of human-driven global warming and climate change. While the debate over A68 continues, so does the seemingly uninterruptible march of climate change and its disruptive and potentially disastrous effects. If we’re lucky, our children won’t see too many major cities disappear under rising seas or lush regions of planet Earth warmed to uninhabitable wastelands.